The last time I recall this feeling was over a decade ago - August 29, 2005. That date of infamy certainly has not been replaced, but Friday, January 20, 2017, will be added to 8/29/05 as a date I will never forget. Where were you that Friday evening and early Saturday morning? On Friday afternoon, I was on my way back to Petal from Tupelo and Corinth, MS, after having visited their respective Boards of REALTORS on behalf of our state association. Following a busy week, my awareness of impending weather was extremely limited, I must admit. I arrived home that evening excited to see my girls and somewhat exhausted from a busy week. By Saturday morning, so much had changed. An EF-3 tornado had traveled from just north of Purvis through Hattiesburg, devastating my beloved William Carey University, and beyond into Petal. Over 1,000 homes impacted and 4 lives lost, not counting the businesses destroyed. So much quickly changed for our community, and so much was simultaneously placed into a proper perspective. The past couple of weeks have been consumed with recovery and clean up. And though this is a new experience, and one I confess that I never want to relive, it's a familiar one. Hurricane Katrina, the 2013 tornado, and now 4 years later - a larger tornado, have developed a resiliency in our area that inspires pride and confidence in our community. We don't wish for these challenges, but let's face it. We've been here before. We know how to rise from the devastation, and in the process, we grow closer and stronger as a community. It's inspiring to witness and be a part of it, and it's a reminder of the beauty and quality of South Mississippians. If you're new to our area, I hope you'll take note of this special quality amongst our people and seize the opportunity to embrace it for yourself. By late Saturday and Sunday, thousands of volunteers were working to help those devastated by the events of January 20th. Amelia and our girls gathered with our Carterville Baptist Church family that Sunday morning to worship and pray. We were also greeted with the news that Samaritan's Purse would be basing their operations from our church campus. 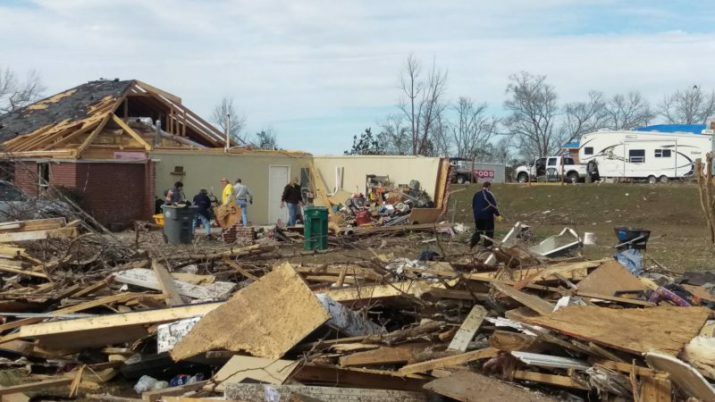 Mississippi Baptists were setting up operations at Petal First Baptist, and hundreds (if not thousands) in our Hattiesburg/Petal community were rolling up their sleeves, opening up their hearts, and giving of their resources to help. It truly has been a beautiful picture to witness and take part in. The recovery will take months and years, but it's reassuring to know that we are a part of a community that cares, gives, and loves. There are dozens of organizations contributing to the rebuilding of our beautiful Hattiesburg Metro. If you're interested in serving but don't know where, teams are currently setting out daily to Hattiesburg and Petal at 7:30 a.m. and 12:30 p.m. from Carterville Baptist Church in Petal (1115 Carterville Road in Petal). Regardless of your experience and skill, you can be used. Won't you join us? All you have to do is show up! Together, we will bring Hattiesburg, Petal, and the Pine Belt home again....post 1/20, and along the way, your real estate team is ready to do its part!